What Pans Do Chefs Use? What Depth Is Considered a Shallow Roasting Pan? Crumple aluminum foil slightly to create a makeshift rack. 1 Can You Use a Glass Pan to Cook a Roast? 4 What Pans Do Chefs Use? You probably don't roast large cuts of meat very often, so you might not need a huge, deep roasting pan. For everyday roasting, such as roasting a chicken or roasting vegetables, you can get by with equipment you already own. A shallow baking dish or pan that is no more than 1 to 2 inches deep is ideal. Roast meats and vegetables at 400 degrees Fahrenheit and don't crowd them in the pan. Most standard roasting pans have a lip that's at least 3 to 4 inches deep. These large pans are made for large cuts of meat -- that 18-pound turkey for Thanksgiving or a large rib roast. The advantage to these large, deep pans is that they hold a lot of meat and they contain the drippings to minimize mess. They're overkill for smaller cuts of meat, though, and can cause the meat to steam, rather than brown. In these cases, go with a roasting pan that is no more than 1 to 2 inches deep. You probably won't find a roasting pan with sides less than 3 inches deep, but you can certainly use other cooking equipment. Try a cast-iron skillet, which can go from stovetop to oven. 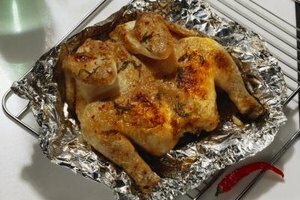 If you're roasting cut pieces of meat, such as chicken breasts, or potatoes and other vegetables, a large aluminum baking sheet is ideal. These trays have a 1-inch lip to contain any drippings, but they allow food to brown evenly and quickly. Most roasting pans are made from stainless steel with an aluminum core. The stainless steel makes a durable surface, while the core conducts heat evenly. 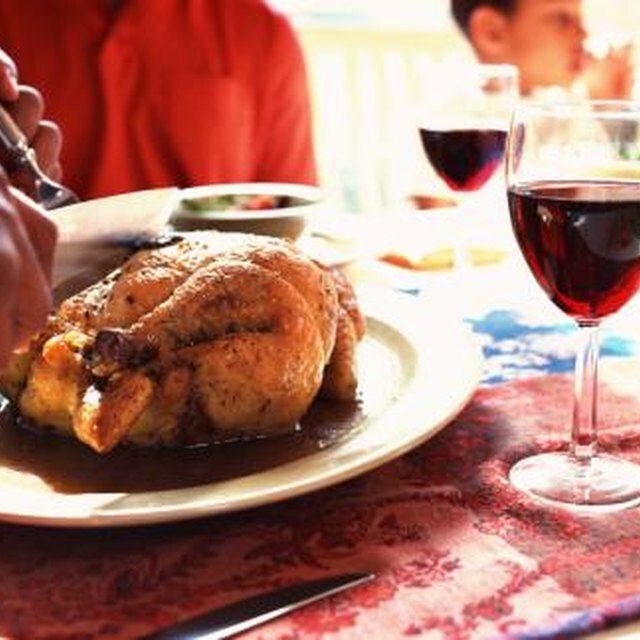 Avoid nonstick pans for roasting meat because you want the bits of meat that stick to a regular stainless steel pan when it comes time to deglaze the pan and make gravy. Cast iron is also suitable for roasting meat. For roasting vegetables, use a nonstick pan or place a piece of parchment paper on the pan or a silicone baking sheet. Spray the vegetables lightly with cooking spray or toss them in oil and season well. Glass dishes work in a pinch, but metal pans generally work better for roasting. Turn the heat down by 25 degrees if you use glass. Not only will you want a shallow roasting pan for roasting small cuts of meat and vegetables, but you'll also want one if you use convection roasting. Convection cooking is ideal for roasting because it retains moisture while creating a golden brown crust. Convection roasting takes about 25 percent less time than conventional roasting. A fan rotating in your oven pushes hot air over and around the entire surface of the food. If you're using a deep roaster, the air won't circulate as efficiently and food won't brown as well. A shallow roasting pan is absolutely essential to get the most from convection roasting. The Kitchn: What is the Best Roasting Pan for Holiday Cooking? The Kitchn: Can You Recommend a Good Everyday Roasting Pan?